Be a part of the Glocal Knowledge advantage. At Glocal we are keen to forge international collaborations with the best universities and faculty in the world for the development of curriculum and programme structure. The cuisine is supervised by a well-experienced chef with an international exposure and expertise especially in West Asian and African delicacies. His Excellency Mr. Niankoro Yeah Samake Ambassador of the Republic of Mali in New Delhi and Mr. Mazen Mahdi Aidaros Algafri Education Attache Republic of Yemen in India visited Glocal University on 12th October, 2017. On 31th August 2017 the office of international students’ affairs organized the Welcome kit ceremony to welcome new students from different countries. Glocal dignitaries along with students from Ivory Coast, Mali, Guinea and Nigeria gathered to enjoy this event. I come from Yemen, I feel good in India. Glocal University is an institution that brings together cultures from all around the world. Coming together from different origins and learning is an extraordinary opportunity that is possible only in Glocal University. Glocal style is unique, giving you the tools to become a successful individual. I am Faisal Hakimi student of B.Sc MLT from Afghanistan. Taking admission into Glocal is like paying for an exclusive world tour. The university is composed of different nationalities which makes it a global community for various learning. It is a wonderful experience for me so far in the university. I am a student of Certificate of Proficiency in English from Oman. When I arrived at the University campus, I was really pleased by its greatness and beauty. The administration personnel are very caring. I have interacted with other students over here they are very polite and friendly. I am Mhango Nchimunya from Zambia, studying in the of Pharmacy here at The Glocal University. 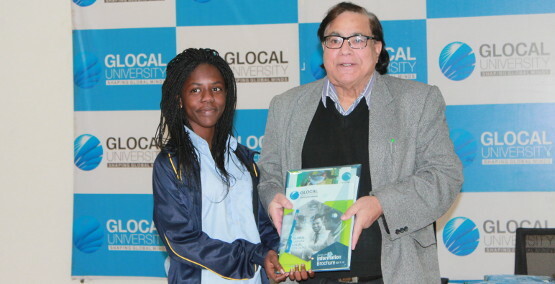 Glocal is a nice place as it gives you the natural environment of studying; its a good place to be in terms of studying. Collaborations at the higher education sector the world over hold the key to both developments in scholarship and to boosting economic and intellectual indicators in the development of a nation. International collaborations in scholarship is often a precursor to acknowledging the importance of new perspectives that may run counter to the prevailing paradigm. 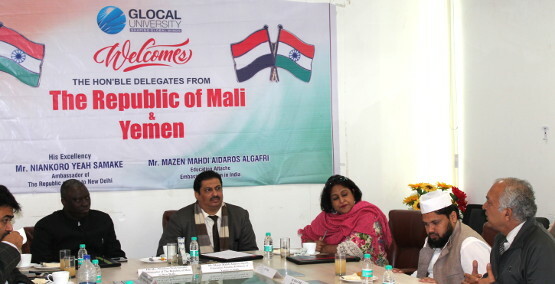 It is in this context that Glocal University has organized this Education and Leadership Summit, to both discuss matters of importance at the forum provided, and also with a more long-term strategic aim of strengthening ties with various countries in order to build up a viable education network, wherein higher education and advance technical know-how will be shared across platforms.